Cellular Shutdown Raises Questions Of Free Speech San Francisco's subway shut off cellphone service to thwart protesters, inciting a legal controversy. First Amendment scholars say they can't remember a time when a public agency in the U.S. moved to disrupt wireless traffic in quite that way, while Bay Area Rapid Transit officials say they had to protect riders' safety. The shutdown of mobile phone service in San Fransisco Bay Area subway stations has constitutional experts hitting the law books. 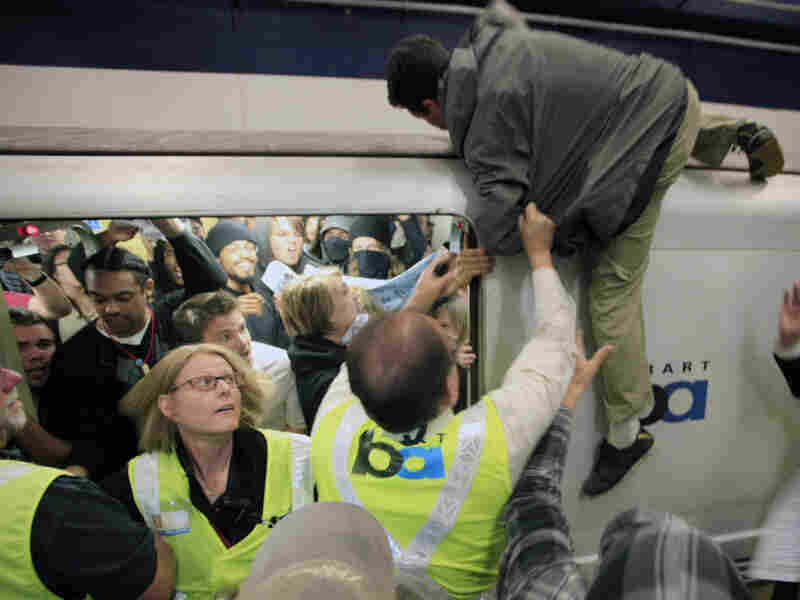 A man is pulled off a commuter train at the Civic Center BART station on July 11 in San Francisco after climbing on top of it during a protest against the July 3 shooting by transit police of Charles Blair Hill. On Thursday, BART officials blocked cell service in some stations to prevent another protest. Authorities for Bay Area Rapid Transit, or BART, blocked wireless signals in certain stations on Thursday in an attempt to prevent protests opposing the July 3 shooting death of Charles Blair Hill by BART police. Police say Hill came at them with a knife. First Amendment scholars say they can't remember a time when a public agency in the U.S. moved to disrupt wireless traffic in quite that way. Now, they're trying to stretch old First Amendment principles to fit in the context of new technology. One group that promotes electronic freedom compared the people who run BART to an authoritarian regime in Egypt, tweeting "BART pulls a Mubarak in San Francisco." "It's very clearly a major First Amendment problem whenever a government agency takes it upon itself to simply prevent people from being able to speak," says Lee Tien, a senior staff attorney at the Electronic Frontier Foundation, a civil rights group. The easiest way to describe what the transit authority did, Tien says, is to call it a broad prior restraint on the communications of thousands of cellphone users — not just demonstrators, but also kids talking to their parents and adults talking to their doctors. "In the past, it's been aimed at, say, newspapers or aimed at broadcasters or at book publishers, and in this case we've got a situation where it's aimed at the cell network," he adds. Courts generally frown on prior restraint in other contexts. For its part, the transit authority says it acted carefully, blocking phone calls in just a few subway stations for a few hours to protect public safety and prevent chaos on platforms where trains race by at high speeds. BART's chief spokesman, Linton Johnson, talked with reporters about the decision Monday afternoon. "There is a constitutional right to safety," Johnson says. "A lot of people are forgetting the fact that there are multiple constitutional rights and are focusing solely on one. BART is obligated to protect them all." Johnson says transit officials allow demonstrations in a special free speech area, far away from the platforms and outside the fare gates, restrictions that he says are in line with Supreme Court precedent that allows the government to put limits on the time, place and manner of protests. Eugene Volokh teaches law at the University of California, Los Angeles. "The important thing here is that BART was limiting cellphone service on its own property, and property that the Supreme Court has before labeled as what is called a nonpublic forum," Volokh says. "It's not a park, it's not a sidewalk, [it's] not a place that's traditionally been devoted to public expression." If government was seizing printing presses to keep people from understanding or learning something, I think traditionally in this country that would just be beyond the pale. The question is, does a momentary disruption of cellphone service constitute that kind of level of government interference with speech? Volokh points out that public universities sometimes block wireless access in their buildings so classes aren't disrupted. And in the case of the San Francisco transit system, the reason for the disruption could matter, too. "Everybody was unable to speak on cellphones, regardless of what they were going to say," Volokh says. "But the reason the government imposed this restriction is a worry ... that cellphones would be used to help coordinate a disruption of BART's service." Gene Policinski, executive director of the First Amendment Center, has been following the action in San Francisco. "I think it raises, at a very bottom line, real serious questions about government interfering with the ability of you and I to talk to each other," Policinski says. "How far does that go? How far will the courts permit it?" Back in his heyday in the 1960s, he says, the equivalent to a cellphone disruption might have been police swiping a protester's bull horn. "If government was seizing printing presses to keep people from understanding or learning something, I think traditionally in this country that would just be beyond the pale," Policinski adds. "The question is does a momentary disruption of cellphone service constitute that kind of level of government interference with speech?" So a body of law that's clear when it comes to old technologies is still a little vague when it comes to new ones. "We're still arguing over how do we regulate content on television 70 years after it became a mass medium, so there's no guarantee we're going to settle this anytime quickly, I think," Policinski says. And as if to illustrate that point, the Federal Communications Commission, which regulates telecommunications networks, says it is assessing the actions by BART. FCC spokesman Neil Grace told NPR in an email that the agency is "continuing to collect information about BART's actions and will be taking steps to hear from stakeholders about the important issues those actions raised, including protecting public safety and ensuring the availability of communications networks."